Yesterday will forever be known as "The Day of Teror". A day where people will look back on me, and say what a brave lad that Stewart was. In the face of almost certain doom, he turned on his iPod and carried on into the dragon's mouth! As the Rent Soundtrack swelled in his ears, he soon experienced incredible pain that no man should ever experience. Yeeeeaaaahhh... I went to the doctor yesterday. 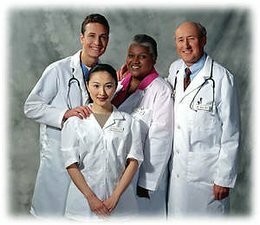 Doctors are never this happy. Infact, I bet they photoshopped this picture. Yep, they probably had big ol' frowny faces before they started tinkering with it. For the last couple weeks, the big toe on my left foot has been really sore. I just figured that I banged it on something and it'll be better in no time, but that wasn't the case. Mom finally found out about it when she accidentally dropped a massive, heavy, Godzilla sized painting right on my foot. I let out a high pitched scream (not unlike a little girl), and mom told me to buck up. I then explained that my toe had been sore for a couple of weeks, and now it felt like it was gonna explode all over the floor. Later on, I showed her my toe.... it didn't look pretty. I'll spare the details, but mom thought it might have been infected. Boy, did I feel stupid. You get a bunch of random stuff when you type the word "Doctor" into Goggle. 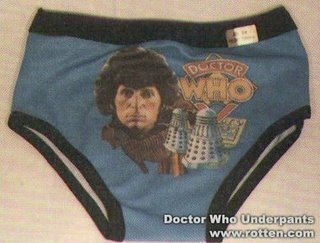 Doctor Who underpants? 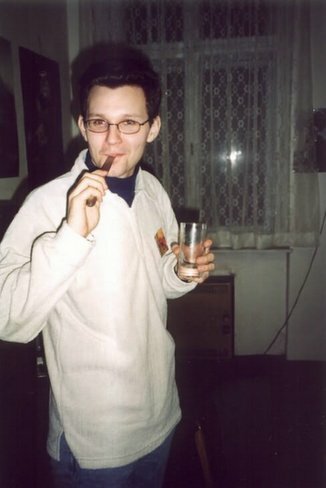 I'm not even that geeky! I'll just say it right now, I hate going to see the doctor. You can just tell, the man loves to torture you with bad jokes. You'll be sitting there, and he'll just decide to crack some bad joke that comes right out of nowhere. You'll be bleeding and he goes "Oh yeah, the bleeding usually stops after an hour or so. Either that, or you'll run out of blood". I thought he was serious! It scared the heck out of me! Haha, just kidding doc, you know I love you. I swear, my doctor looked just like that!! The fire and everything! So anyways, the doc deduces that I have an ingrown toe-nail. 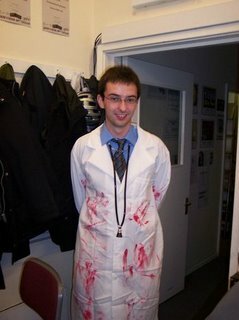 I was thinking 'Well, that's great doc. Gimme the pills I need to take and we'll call it a day". But of course, the situation was much more serious then that. First, he had to stick this massive needle into my toe and inject some stuff to numb it up. THIS HURT ALOT!! When a doctor usually says you'll feel a little sting and a burning sensation, you figure that he'll just poke you and be done ub a few secounds. Of course, this wasn't the case. I'll just say this... OWWWWWWWWW!! I'm sorry mam, but your son's swolen toe seemed to be more serious then we thought. As it turned out, your son had been infected by a retro-virus that turns ordinary people into brain-eating zomibes. He's stumbling about the halls as we speak. After he poked my toe about six or seven times, I figured it was time to turn my iPod on. Trust me, this entire tramatic experience was made bearable through the magic of Rent. Next, he pulled out this huuuuugeee metal thingy (I don't know what to call it), stuck it under my toe nail, and lifted it up. The pain, the horrible pain!! And as if that wasn't enough, he seemed to take great joy in pulling out a jumbo sized pair of sizzors and cutting the nail in half. OUCH! While the searing pain was nearly unbearable, our hero stood in triumph upon the procedure chair. No more would his toe ache in terror, no more would the evil doctor poke him with needles. He was a free man! Unfortuantelly, he had to wear a really clunky shoe that the doc gave him for while the toe healed. Much complaining ensued on the part of our hero. A Message from the Blogger: While it was a truly grueling experience, I may have exaggerated just a little. Not very much mind you, because it was horrible. However, the tale you had just witnessed may have been double dipped in whinning and lies! But filled with such hope and promise. That happened to me a few years ago. It was incredibly painful, I don't think you exagerated at all. Hail the YouTube Crew (all of my Kingdom of Hearts fans in other words).